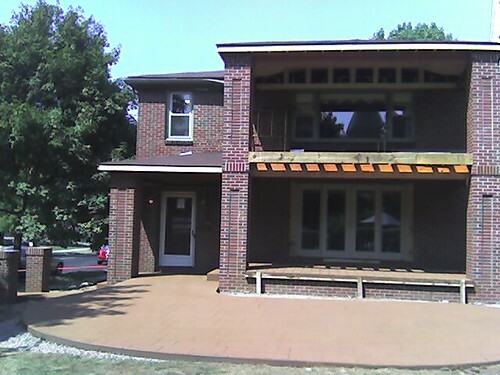 As you can see, the brick has been completed and the stamped concrete for the patio, lower unit porch floor, walk and steps was poured (today). Recently, replacement windows were installed throughout the house, and the Pella sliding door with between-the-glass shades was installed in the lower. Yet to come: Matching sliding door upstairs, floor, ceilings, hip height wall with planter box troughs on all three sides with sliding screen panels from there to the ceiling. Also, landscaping, outdoor electric, shutters and a nice gate. It’s been a long road and we still have about a month to go. It’ll be fantastic when it’s finished! It’s already looking pretty fantastic. I can’t wait to see the finished project. its gorgeous..and the waiting is killing you i am sure..